The variety of kitchen countertops available nowadays seems limitless. But when you look closer at each option, the best choice for you will become quite evident. 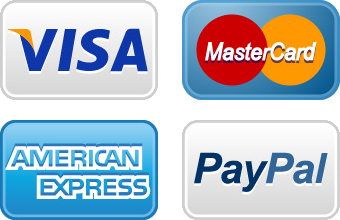 There are a number of basic parameters you should consider before settling on any one choice. Your local kitchen contractor and kitchen designer will be able to give you details, but the list below of kitchen counter types will serve to narrow things down quite quickly. Why Are You Installing New Countertops? Like with all things there’s a tradeoff between cost, design and function. Not one kitchen counter material will do it all at the same price point. Or yield a return on your investment. 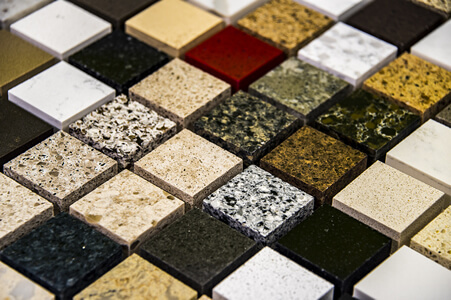 There are 6 basic considerations when deciding on a countertop. 1. Before you look at the list below, using the guidelines above, you’ll need to be very clear as to why you’re remodelling your kitchen – so you can properly match up your choice of countertops with the entire project. These are engineered products, and are extremely durable. They’re highly resistant to heat, scratches and even impact when you drop something on them. Another plus is that since they’re not a porus material, they don’t have to be sealed. 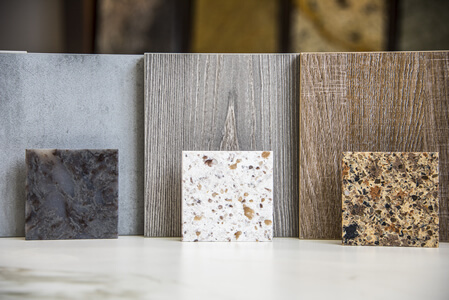 Also, since it’s an engineered stone countertop, they are available in a wide range of patterns and colors to compliment your kitchen design plans. This is probably the time tested most popular choice of most homeowners. It not only offers a high-end look, which increases your kitchen’s value, but the variations in color result in a one-of-a-kind countertop. There is however a price to be paid for this level of uniqueness. 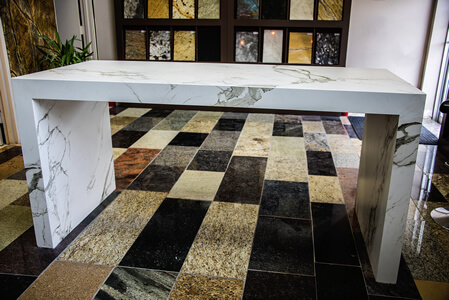 Because granite is a natural material, and because colors and patterns vary, matching up slabs for different surfaces and for joints can become a challenge. Carefully done, it’s not an issue, but it’s an important consideration when picking out the slabs. Also, since the stone is somewhat porous, you’ll have to wipe up stains quickly. Particularly wine and soda, and even any oils or acidic fluids. 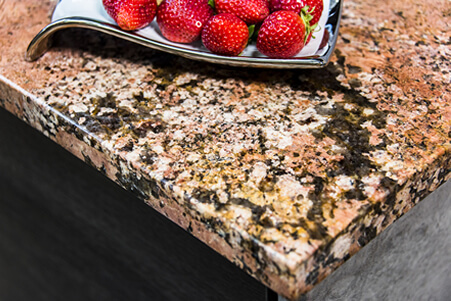 This care will need to be taken with any granite countertop, even if you – as you should – seal it at least every year. From a cost perspective, it compares to quartz countertops. Yes, they’re making a comeback! And, they’re still on the on low cost end of the range of possible kitchen countertop choices. But, their revival is based on the use of greatly improved manufacturing processes. You can now have a laminate countertop that looks like wood, or even quartz, at a fraction of the cost. So the possible range of colors, styles and textures in laminate countertops have become extremely wide, and can compliment any kitchen design. The only caution here is that if your kitchen remodeling project is planned for an expensive kitchen, installing a laminate countertop to save money will have a negative impact on the value of your home. Keen eyes looking for – and expecting – real quartz will catch that discrepancy quickly. And that could lead to questioning other aspects of any other home renovations you may have done. It can a make a less expensive kitchen remodel look more expensive though, so this choice only works one way. Making a less expensive kitchen look more expensive. 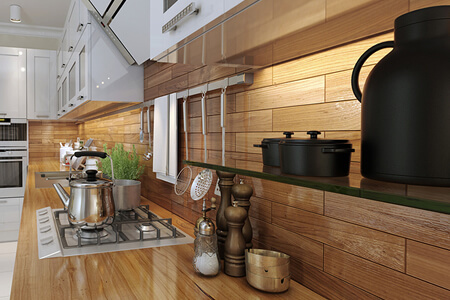 Wood is actually a great choice a countertop. Assuming it fits in with your kitchen design style and layout. It is highly heat resistant, so hot pots will not hurt it. Also, it’s a built in chopping block – assuming you don’t mind a few scratches. However, wood can be used to add variety of surface looks and treatments for different prep areas. Not only is it functional, it can be incorporated into kitchen style design to add visual interest and differentiation. Wood countertops however, like granite countertops will need to be sealed, at least annually. 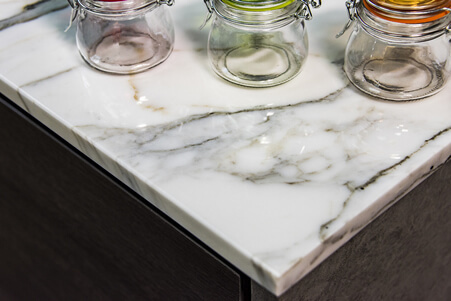 Of course marble countertops need due mention on the list of most popular countertop materials. It’s a perennial favorite. It’s wonderful smooth surface and creamy look remains a time tested choice, bridging eras and design styles. But, since it’s a natural stone, it has it’s drawbacks. Which are ony drawbacks if you consider them to be so of course. Marble countertops are made of natural porus stone (Like Carrara or Calacatta marble) and need to be sealed to reduce staining and the possibility of eching by any acids or oils. So just like with granite countertops, quickly wiping away wine, oily or acidic spills is a must if you want to keep your marble countertop looking bright and beautiful for many years. Honed granite countertops are made by terminating the polishing process before attaining a high polish. This creates a more of a matte and low-gloss sheen. This look is very complimentary for kitchen designs which call for a softer – more honed – countertop finish. And since it is granite, the same characteristics of durability, heat, scratch and chip resistance applies as it’s polished counterpart of polished marble countertops. However, like we mentioned above, you’ll need to seal it regularly. This is of course a very modern choice. Or a commercial one. Stainless steel countertops are durable in every way. Heat and scratch resistance are no problem. But, one of the most appealing characteristics of a stainless steel countertop is its ability to inhibit any buildup of bacteria. It’s also very easy to clean. The look of stainless steel is very unique, without any real choices. So if you’re looking to remodel your kitchen in a very modern way, are looking for the most hygiene counter surface possible, or for a more commercial kitchen look, then it’s great, and possibly the only choice within those parameters. Glass countertops are also on the more modern, or contemporary end of the kitchen countertop design choice spectrum. They share similar characteristics to stainless steel countertops. Glass is not porous either, is scratch and stain resistant and is very easy to clean. It can also be cut into any shape called for in your kitchen design. It is however on the more expensive end of the kitchen counter material menu of options. Just keep in mind that you should make sure your choice of glass countertop is at least 1 inch thick and is made of tempered glass. This is an interesting option, and your kitchen design may benefit from exploring it. 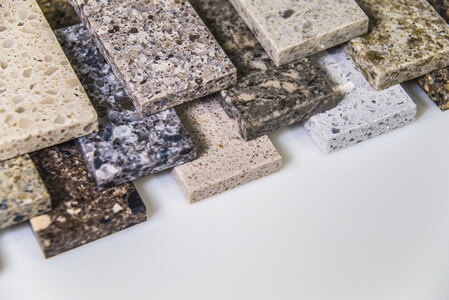 Recycled countertops can be made from a wide range of materials, which encompass a long list of potential pre- and post-consumer materials. Just about anything can end up in a recycled countertop. From glass, to paper and even concrete, usually held together and hardened by a resin. 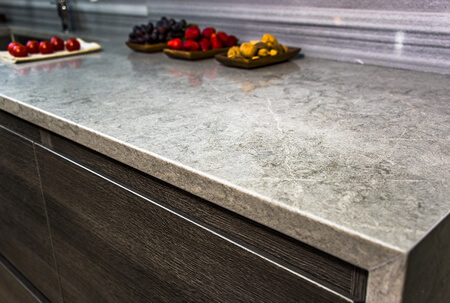 They can very closely resemble both the look and the feel of just about any conventional countertop. Plus, they can still deliver a hard and durable work surface for the active cook. It’s important to note that recycled countertops are not old countertops brought back to life. They are manufactured new from a range of materials – which may have been something else in their previous useful lives. Concrete offers a unique level of versatility as a candidate for your kitchen remodeling project. From a cost perspective, it’s on the higher end. However, it can be cast in any shape, thickness or size, making it the ultimate choice for a custom kitchen design. If there any seams, and they’re filled properly, it will be a truly seamless countertop. It does need sealing, since it’s porus, which will make it stain and water resistant. Although concrete is obviously heat resistant, the irony is that concrete surface sealers are not. So to avoid staining the concrete sealer, hot pots should not be placed directly onto any concrete countertop surface. Concrete can be cast with any form of edge detail, will accept inlays, and offers nearly endless color options. Soapstone is a truly a wonderful choice for a kitchen countertop. Assuming it will work with your kitchen design ideas. It’s a natural stone, so it’s green as far as that goes. Plus, it’s non porous, so you don’t have to worry about staining your countertop with anything you spill on it. And because soapstone is non porous – you don’t have to seal your countertop with chemicals. Another great boone for this wonderful material is that it’s incredibly heat resistant. Hot pots on the counter? No problem. But accidents do happen – and they’re easy to fix too! Soapstone can be repaired. This choice for a countertop is perhaps on the other end of the maintenance spectrum. It does look beautiful, so it’ll be question of balancing form against function. 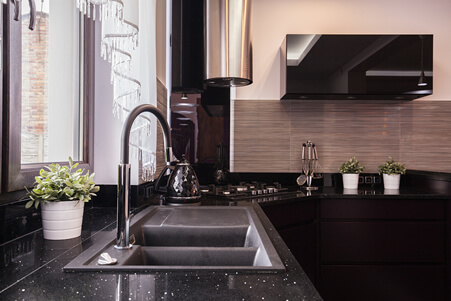 It’s probably one of the higher maintenance choices for a countertop because of its pitted surface which needs to be sealed to avoid trapping food and absorbing liquids which can lead to the buildup of bacteria. If you don’t cook a lot, but entertain a lot and are looking for a rich and creamy surface based on design – more than function, then this may work just fine. This choice holds up the lower end of the countertop range in terms of cost, and is probably the only one with a do it yourself potential. The design and color options are only limited by the choice of tiles available. It has a distinctive look, so take care when selecting this option, as it may not add much value to your home. Also, the grout will need to be sealed and maintained to avoid discoloration and bacteria buildup. Now that you’re armed with all the basic information you need to not only make solid decisions about your potential choice of kitchen countertops, you’ll be able to ask informed questions when dealing with and interviewing potential kitchen remodelling contractor candidates. 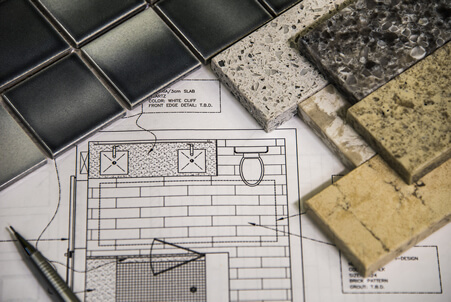 As a rule, being informed is good, because it means you’ll be in a better position to understand the long term implications of your design and material choices when taking on a large project like remodelling your kitchen. On the other hand, a little knowledge can make you indecisive. The best tact to take is to become as informed as reasonably possible to get the process going with a contractor who’ll install your new kitchen countertops, then be in a position to make decisions quickly – because you’ll understand the options and trade-offs described by your contractor.